Add a surcharge or discount based on payment method. To set up five separate surcharge settings for different payment types. When set to Yes, payment type surcharges will be enabled. Control-click to select as many payment types that you wish to apply the surcharge to. Enter the fixed transaction cost you wish to charge – eg. 10 (remember not to add any currency symbols). Enter the surcharge description that will be visible to the customer – eg. “Paypal fee”. Enter the minimum order amount needed for the surcharge to apply – eg. 20. Enter the amount without any currency symbols. The amount will be in your store's base currency. This setting is available for “Payment Method” and “Payment Method 2” only. 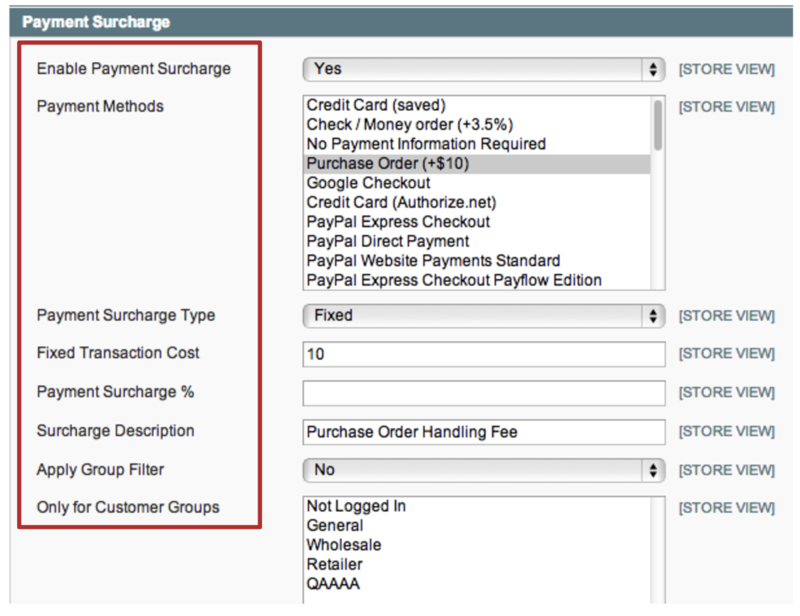 Enter the maximum order amount for the surcharge to apply – eg. 300. Set to “Yes” to apply the surcharge only to customers from certain countries, or to exclude customers from certain countries from the surcharge. Choose to apply or exclude the surcharge based on either shipping address or billing address. This setting is available for “Payment Method” and “Payment Method 2” only. Control-click to select as many countries as you wish to apply this payment surcharge type to. This setting is available for “Payment Method” and “Payment Method 2” only.